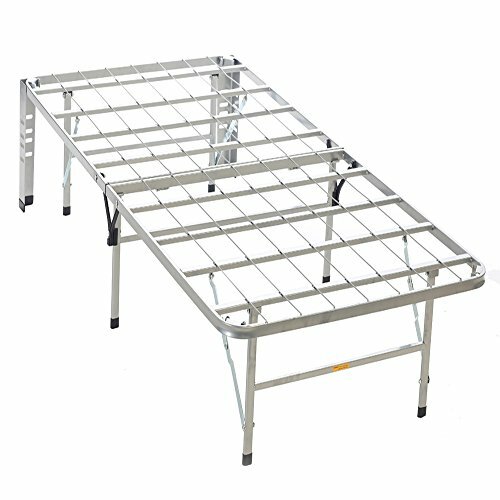 The Bedder Base is a complete mattress support system. Twin - 39" Width. Eliminate the need for a bed frame and a box spring. No foundation or frame needed - only a mattress. Easy to assemble - No Nuts, No Bolts, No Tools! 14" high for spacious under the bed storage. Made of heavy duty cross bars and wire mesh - all quality steel construction. Silver powder coat finish. Ships in one box. "Carry it, Unfold it, Sleep on it!" Carry it - unfold it - sleep on it! If you have any questions about this product by Hollywood Bed Frames, contact us by completing and submitting the form below. If you are looking for a specif part number, please include it with your message.